Back Again, Sort of; I’m on Vacation! 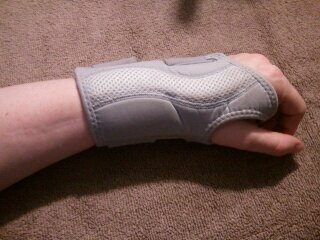 Right Hand with New Wrist Support. This was the “problem child” wrist from my birthday. Wow! Has it really been a month? Well, I’d love to share some fantastic news, and tell you all that I’m completely mended, that my wrist is “normal,” and moonbeams and ponies are flying out of my…nose, but…that’s not true. 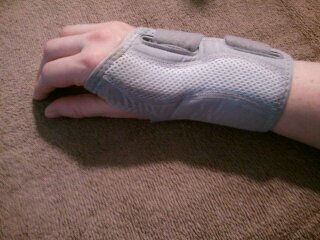 Left wrist was feeling left out, and now I’m sporting a wrist support on both hands. Ouch! Not only that, but I’m probably going to be making a “fashion statement” for a while. In fact, I don’t know if or when I’ll be back to the way I was before. That’s life, I suppose. I scheduled one day last week to feel sorry for myself, to really wallow properly, and have myself an ugly cry. Yes. I have to “schedule” a crying jag and make it work into my busy schedule. I’m not sure what that says about me, but I think that’s funny in retrospect. I’m weird that way. I waited until Hubby was out working, Kiddo was with the grandparents, and I FINALLY had the entire house to myself. It felt good to cry. I might cry a handful of times in a year. Crying isn’t really my thing. But, once I got that over with, it was time to focus on what I can do. Macaroni art, anyone? Left Arm Wearing An Almost Identical Wrist Support. This wrist support is 10 years older the the one for the right hand. I bought it after the surgeon put me back together again. Broken arm. If you look closely, you can still see the scar. And yes, I sometimes make up outrageous stories about how I got said scar, when people get too nosey. Cool stuff! Aren’t these wonderfully obnoxious! LOVE them!!! While I don’t mind the look of my “Wonder Woman cuffs,” they do tend to get dirty. I’m thinking about making some cozies for them, something fun and a little whimsical. 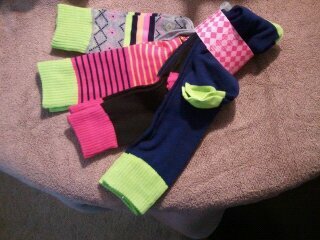 I picked up this package of socks for $4, on Thursday. I think I can modify them into something useable. Yes, I’m taking the Pippi look and running with it! Now…if I could just figure out an easy way to steampunk a set of wrist cozies. Hmm…. Sorry you’re all banged up, Pippi. Although, steampunk Wonder Woman cuffs could be something I could get into. Ooh @ Father Ted. I should rewatch. Miss you too, Claire!!!! Huge Hugs!!!!! Usually fictitious story has something to do with a bar fight. This works best if I have my hair up in a bun and no make-up on. I look like I should have either been a librarian or a Sunday School teacher! Also, in fictitious story, the other guy looked a LOT worse, and they DID have it coming! Actual way I broke my arm? I got bucked off the horse I used to own. I was soooo mad that she with misbehaving, I didn’t even feel it break! I went to stand up, and it looked like I had two elbows. So gross!!!! Real story is actually even more badass than fiction! I’m with you. I have to make time to have a good wallow normally. Though I had a spontaneous one the other day, LOL! PMS will do those things to a person… Glad you are feeling better!! I knew you were on vacation by the way because my net cut out 😉 ha ha! they finally got it back… thank god…. Poor, Jo! My vacation LOVES to mess with your computer. Hugs! I understand about scheduling Wallow time. We all have to do it. I had thumb problems. They do heal eventually. You’re taking it better than I did at the time. And now for some writing perhaps? Thanks Sue! I’m starting to see some improvements. Taking the week off work helped a lot! I’m so sorry about your poor hands. 😦 I know it has to cut down on any kind of productivity. Just do the best you can and adapt where you can. I understand the crying jag. Sometimes you just have to.